Drummed for long #RaviramAnbumani in the Indian Record Holders At World Stage 2017. You have to beat your own drums, blow your own trumpets to make your presence, value felt in today’s time, in almost all walks of life. You need to take care that you should not fall short on almost anything, in front of other. On one hand if there are people who believe in these on the other hand there are also those who don’t pay heed to these. Earlier the better. However, with hardly any reference to these but still believes in playing drums nonstop, continuously for a substantial duration of minutes, time all together is Raviram Anbumani, a very young boy, expert, proficient, champion in drumming, who drummed for minutes, unstoppably in the Indian Record Holders At World Stage 2017 gala, which was held at Siri Fort Auditorium, New Delhi on 12 a Sunday in November 2017. 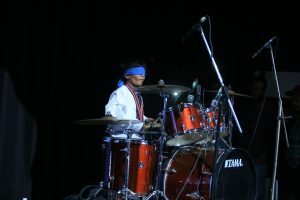 Raviram Anbumani ( Raviram Drums ) who has a record in Non Stop Drumming with India Book of Records, showed his drumming antics on the stage in the Indian Record Holders At World Stage 2017 gala, held at Siri Fort Auditorium, New Delhi on 12 November 2017, Sunday. Comments for Drumming Champion at Indian Record Holders At World Stage 2017 are now closed.